Jackie talks about the first quilt that was completely handmade and it was the realisation of an idea she had for a quilt for a long time. 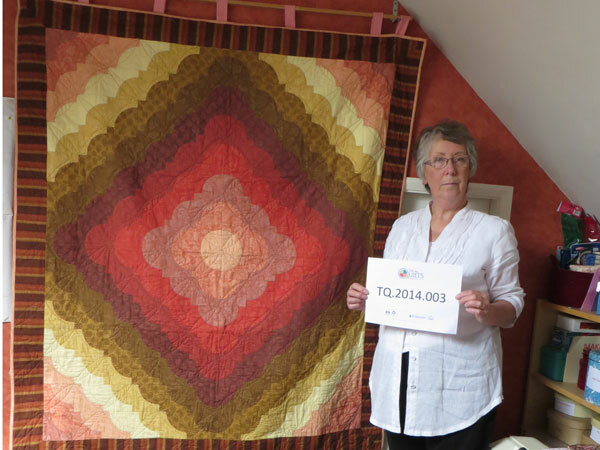 The quilt was also important as she used the making of the quilt as therapy after the sudden death of her husband. She talks about showing the quilt at an exhibition, her mothers’ pride and how she uses the quilt now. Jackie goes on to talk about quilts she has made as gifts and how they respond to her quilts. In the second half of the interview, Jackie discusses selling quilts, buying fabric (particularly during her trips abroad), people who have influenced her quiltmaking and becoming a contemporary quiltmaker. Dorothy Baird [DB]: Jackie, you’ve chosen a quilt for us to talk about. Why this particular one? 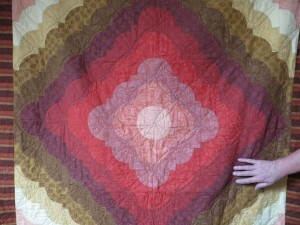 Jackie Norris [JN]: It was the first hand-sewn quilt in its entirety when I started piecing. 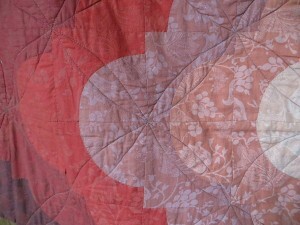 Previous quilts had been machine-pieced but that one I stitched every block by hand. So they were cut, measured, pinned, stitched and put together and each quarter of that quilt contains eighty-four of those blocks. So that was a lot of hand stitching. And it was very therapeutic for me because I bought the fabric for that on my first trip to one of the very big quilt shows, when I went to Quilt Expo in 2004. I’d had the idea of doing something in my head for a long time but it was only in 2004 that I looked at a box of fabric on a stand in The Hague in Holland and decided that was the quilt I wanted it for, the idea in my head. When I got back to the hotel and we were doing our ‘show and tell’ and I pulled out this box of fabric and I also pulled out another kit that I’d bought and I brought a book out that I’d had the idea from for making this quilt and I decided to buy the book too. When I got home from Holland I had gone back to that stand and bought a second box of that fabric because I knew I would only want half of the colours in the box and one box wasn’t enough and the box was called a Bon Ton and the colours in it ranged from white through cream, through the various colours in that quilt into turquoises, blues and eventually to black. And it just wouldn’t have done what I wanted if I’d used all that range. So, hence the second box. It cost me a lot of euros and it took a long time to make, obviously because it was measured and pieced by hand. I made two templates for each of the pieces, I made one for the finished size and one for the size plus the quarter inch seams. So I drew round the quarter inch seam added and then I’d pencil drawn the line round the smaller template so that I knew where I was stitching. So every piece of that centre of that quilt was marked and cut laboriously and I still have a bag of leftover bits upstairs in my sewing room and I just don’t know if I can revisit doing something with those because it took me four years from start to finish to make that quilt. And the reason it took me so long is because I had all the pieces sewn and the blocks put together but I couldn’t find a border fabric. And that took four years to match a border fabric and I actually ended up buying that border on a quilt stand in America, in Houston and it was only by chance that I walked by the stand and spotted it and my head said ‘That’s it’. I had no idea it was going to be such a good match, I just hoped I’d got the right stuff. And when I bought it that I’d got, you know, fabric. The therapy from that quilt was because my husband died in 2003 and it took me a long time to plug my sewing machine back in again and I had a lot of long evenings to get through and hand stitching those pieces was my therapy; that was my way of dealing with it. My family knew that I was on a road of my own when I was quilting that. They knew I was not back in the depths of despair because I’d started sewing again and it got me back into going out to quilting, going to quilt shows and groups that I belonged to at the time. And it was a sad thing when I finished it because I knew my therapy was over, but it wasn’t. There are still times when that quilt and I have a lot to say to each other and I do say a lot to it because I talked to it when I made it, I cursed it while I made it, I cursed the world when I made it, I cursed my husband while I was making it. How dare he leave me? And why am I sitting here sewing this damned thing together when we should be doing something. I had those sort of thoughts but by the time I’d finished it, they had sort of faded away and I knew that quilting was going to fill the hole in my life. So I put it into a show, which was a group I belonged to at the time, and I took my mother to that show. And my mother was absolutely delighted to see my quilts hanging in that show and she was even more impressed because she didn’t know how much sewing I actually did. Although I had been sewing since I was eleven, she had no idea how much sewing I actually did and she was very, very impressed when somebody came up to me and said, ‘Did you know your quilt is going to Hever?’and I said ‘Which one?’ because there was more than one in the show and it was that one and my mother was absolutely over the moon when we came out because she could ring family up in London and say, ‘Did you know our Jackie’s got a quilt in a show at Hever Castle?’ And I thought, I didn’t know whether or not to say to her, ‘Don’t bother because they won’t go, they’re not quilters, they don’t appreciate patchwork’ but I don’t know whether or not she did because we never heard anything back because… I don’t know that they actually went. They’re dressmakers, not patchwork and quilters. So my mother was chuffed to pieces and I must say I was pleased. When people look at it I wonder what they think of it. It is hand-pieced but I did machine quilt it. It was … I was at that stage and I marked that all out with a double wedding ring template that I’d had and I quilted on the double wedding ring lines and it was hard, it was very… because I knew I was finishing my therapy, I suppose but on top of that I never quilted like that. I had quilted round blocks and I’d quilted along the lines. I had never quilted a quilt to that extent and even now I look at and think ‘there should be more quilting on that’, but I’m not going to touch it now. It’s mine, it’s my comfort blanket. On cold evenings when I just need a little bit of warmth, then I can sit under that quilt and I can wrap myself in it. It normally hangs over the back of the settee but because I am decorating, when I am finished I think I am going to hang it on the wall to replace the quilt that used to be there which now hangs in another room in my house. So it will have a home with me for as long as I have my home and my life and from then on I don’t know where it’ll go. I don’t know what my family will do with it. They all think I’m nutty, they think I’m completely and utterly bats, whatever I do, they don’t appreciate my sewing. They appreciate the fact that I can actually teach them what they need to know about it but they don’t appreciate my quilting, I know they don’t and I know that when it comes to it, they will look long and hard at my stuff and I know that somebody will be thinking ‘a skip, down the tip, in the bin, whatever’ because I just have so much stuff up there that they will be horrified to see what mother has spent their inheritance on and they won’t appreciate it at all. They don’t quilt, they do not quilt. My ex-daughter-in-law appreciates my quilts. I know how much she appreciates my quilts because when my husband died, there was another quilt on the bed at the time and I was six hundred miles away and she whipped into the bedroom and she whipped that quilt off the bed and she took it home and she put it in the washing machine. And my ex-daughter-in-law is a hot wash woman and it went in the washing machine more than once and she ironed the life out of it and gave it back to me so proudly that she had rescued it from my house and said ‘I hope this is OK. I have washed it three times on a hot wash and once on a cool one’ and I just took it off of her, I hugged it and I took it upstairs but it broke my heart. a) because that was the one on the bed when my husband died and b) because she’d washed the life out of it and it was the first quilt I ever made, the first full size bed quilt I ever made. I still have that quilt, it still is on my bed but it’s not my chosen one because the story behind that is far too heart-breaking. So the other one, my therapeutic quilt, is my chosen quilt. I love the colours in it, they’re my colours. I do love the colours and you can see they are definitely my colours and I love The Drunkard’s Path not as much as I absolutely love A Mariner’s Compass but the Drunkard’s Path. I think I chose it because I knew it was going to be difficult, I knew it was going to be hard but it was also going to keep my mind occupied, stitching these bloody half circles, stitching round these curves, sorting these blocks out, making sure that they all matched, unpicking those that didn’t and getting it all put together. Where do you go from there? It’s mine. DB: You seem to invest your quilts with tremendous emotions, all your feelings of whatever you’re going through at the time, things that are very important. Do you? I know that happens at key moments of your life. That was true for the special quilt. Do you find it now, when you start on a new piece of work, there’s a huge emotional involvement, something very powerful? JN: I have… there’s a couple of quilts that I have made which mean a great deal to me. I don’t own them anymore. They were made as gifts. I have some very, very dear friends and when my husband died, they were away on a holiday and they cut their holiday short to come home, for me and that meant a great deal to me and they, when they were married for forty years I made them a quilt for their bed, and it’s a Friendship Star. I didn’t hand piece it, I machine pieced it but I hand quilted that and there was a lot of love and friendship went into that. I have known these people now for over twenty-five years. In fact I would say, thirty years, because I made, I’ve made them something for every special anniversary, starting with their 25th and next year will be their 50th so I have known them a long time. And the other quilt that means a huge amount to me is one I made for their daughter for her second wedding anniversary, and I, second wedding anniversary being cotton, I made them a double wedding ring quilt and it was very special to them because on their fourth wedding anniversary they went to Scotland on holiday and being only in their early forties with a young child under five they were really looking forward to this holiday and they pitched their caravan and twenty-four hours later they were in intensive care in hospital because the husband had had a stroke, at forty three years old, that was a huge shock. And I know that quilt lives on their bed and I know how much that quilt means to them because that is something, that was tactile that he could feel. He will never walk properly again and he’ll never speak properly again. His life is totally different but it meant a lot to me when I knew that they had kept that quilt on their bed because Scott can feel that quilt, and he can take that with him, he can put that on his chair and he has something to wrap himself in and I was touched by that when I found that out that they had, you know a lot of respect for that. And she asked me about washing it. So yes, I put a lot into my quilts. I think a lot about my quilts when I’m looking at what I’m making, I think a lot about my quilts. Sometimes I throw a quilt together because I just want to get it done. Sometimes I go on… I’ve been on some residential weekends and I’ve been there with fabric and because the weekend has sometimes been to do two quilts, matching, I must admit I have virtually thrown them together. I don’t like them, I don’t use them. I have quilts for my spare bedroom. When I used to have twin beds up there I would have the two quilts on the end of each bed and there are a pair for summer, there’s a pair for winter and there’s a pair for spring. I haven’t got a pair for autumn yet but I have another pair for Christmas. But I don’t appreciate those because I didn’t have a purpose for making them, it was to go and spend a weekend doing what I like best and although I was doing what I loved doing I wasn’t doing what I wanted to do and it’s other things that I have more of a feeling for – things I’ve made for me, things I’ve made for other people, things that I give away. There are people around that have my bits, there are people around who have had my bits and who don’t have them anymore. I have little boys in Scotland who love their little quilts that were given to them when they were babies. ‘Why has George got a quilt? Why haven’t I got a quilt?’ ‘Because you had one when you were a baby”’ my daughter’s matron of honour tells her little boy, ‘You’re eight, George is a baby, you had one when you were George’s size’ and explaining that to a child… And I don’t see those children because they live so far away in Scotland but I get told that those quilts are still with them and they still have them. They’re like Linus with his blanket. They tootle off round down to the loch, round the garden and sometimes when they’ve had bad days, I know they’ve had them as a Linus quilt. They’re probably well worn out by now. They may not even be the quilts I actually gave them, they may not look anything like it but I know those little boys and I know their parents really, really like those quilts. They appreciated it and they gave me such a big hug when I went with those and then said ‘Will you take those and have them?’, because their family still live down here so they come and they visit my daughter obviously. DB: Those quilts were given with love and affection. How do you feel about selling your quilts? JN: I don’t know about selling. I have never put a price on a quilt for anybody to think they could buy, I’ve never put a ‘Not for Sale’ notice on, I’ve never put a ‘For Sale’ notice on anything that’s been in a show. I’ve never thought about it. Recently I was in Norfolk and we went to the Bead and Textile Fair at Norwich where we were on the Quilters Guild stand and there were four of us. I was being a busybody, as I normally am, making things tidy and talking to people which I do and people were walking past. And I went off for some tea and when I came back I had got a lot of my journal quilts on the table because I do contemporary quilting and people had been and looked at these quilts and one of my friends said to me, ‘Somebody asked if you wanted to sell one of your journal quilts.’ And I said, ‘Did you sell it?’ and she said, ‘Well, I didn’t know if you wanted to sell it’ and I said, ‘I’ve never thought about it’ and she said, ‘Oh’, ‘And what would I sell it for?’ ‘Oh’, she said, ‘Well I don’t know, what sort of price would you ask?” and I said, ‘It’s a journal quilt, it’s eight inches square. How much could you ask for a journal quilt?’ And she said, ‘Well it actually wasn’t one of those, it was one of your landscape ones.’ ‘Right, ok if she comes back, we’ll ask her what she wants to pay for it.’ She said, ‘I think she’s gone.’ And I was quite surprised that someone actually wanted to buy one of my journal quilts because they’re not pieces as I call quilts, they’re play bits. The journal quilt is something that you do once a month through the year and it’s a chance to play with different techniques and ideas and fabrics and it’s never occurred to me to ask what price. DB: If you do, as you seem to, put a lot of feeling, emotion and purpose behind the creation of a quilt, how would you determine a price for it? How could you? JN: You can’t put a price on love and I love quilting but you can put a price on the fabric, and I suppose I would actually look at the cost of the fabric, add in the percentage of time spent at a sewing machine. So if I knew it had taken me twenty hours to do then I said ok that’s a pound an hour sewing time on the sewing machine, electricity-wise and the iron, of course, because you’ve always got the iron going when you’re sewing. And then I suppose if I worked that out – fabric, electricity, and added on the ten percent cost for time and looked at the figure and thought ‘oh we’ll round that up or round that down’. I see quilts with prices on that vary from what I call silly cheap to silly extortionate. I would never put a price on a quilt as high as some of them I’ve seen although there are some I wouldn’t pay a penny for, let alone a hundred pounds or even a thousand pounds. I don’t care who makes them, if I don’t like them, I wouldn’t pay that. Even if I loved that quilt I wouldn’t buy it at that price. If I’ve seen it and thought ‘Oh, I must have that’, there’s no way! I’d put an offer in at a silent auction, if I thought something was worth having but I wouldn’t look at buying a quilt. And then again if I was looking at selling a quilt, would somebody think the same about my price? So I’d have to balance that. DB: Are you a great impulse buyer, with regard to fabric and bits and bobs? JN: I used to be. I used to buy it, I would buy it when I went to the shows by the bagful. I would think nothing of whipping out the plastic card and going home with two, three hundred pounds worth of fabric and more. And I still have, from my first trip to Houston in 2004… I went with one suitcase and I came back with two. I never counted up the amount of English pounds I spent, I never converted it, I never looked at the credit card bill, I just paid it because I figured, ‘I may never come back here again. I’m going to have those’. And I was going around the stalls buying ninety fat quarters for sixty dollars and at the time the dollar was nearly two to the pound. I wasn’t going to leave that behind. There’s no way. I still have some of that fabric upstairs. That’s ten years, its old hat now but I like it. I have been to Paducah, I’ve been into Hancocks in Paducah, not once, but three times and each time I went round with a trolley and each time I put bolts of fabric into that trolley and when I got to the cutting table, and she says, ‘How many yards would you like, madam?’ Because they still work in yards in America. I love it, I hate centimetres and I would say, ‘Oh, give me three and she’d flip it off the bolt and I would look at it and I’d think sometimes, ‘No, no make it four and I would just… I would go back and I would fill another trolley on another day. ‘Are going to Paducah today?’ ‘Yes’, ‘Are we going to the quilt show?’ ‘No.’ ‘Where are we going?’ ‘We’re going to Hancocks.’ ‘Why?’ ‘I need more of that other stuff. I need more of this’. And I’m the same with thread. I did Houston 2008 and I met some friends there from England and one of them has a fabric company and Julia said, ‘We can get into Quilt Market, it’s not open to the general public, but because I sell fabric and because I have an outlet in America they are going to get us passes to get in to Quilt Market on Sunday. Do you want to come?’ And I said, ‘I’ll see you at the door’. We were staying in separate hotels. So we went and we couldn’t get hold of the people with the tickets. And we were sat having a cup of coffee and Julia found she’d sat on a seat that somebody had spilt coffee over so we had to go and clean her trousers. When we came back, the table was gone so we sat at another one and we were chatting about how we were going to get in and the ladies on the table next to us in the broadest American, western Texas, whatever accent it was, ‘Are you trying to get into the show?’ ‘Yes’ ‘Have you got tickets?’ ‘No, but we’re trying to get hold of somebody but we can’t get through to them.’ ‘How many tickets do you want?’ ‘Well, it’s just three of us.’ ‘Stay right there.’ And she dashed off and she came back and she said, ‘Here you go.’ She’d got us three tickets to get into Quilt Market. Aah, joy. We got in where the buyers are. It was just an absolute eye-opener and I found a stand selling Robison Anton threads for a dollar a reel. I filled a basket, I texted my friend and said ‘Aisle so and so, stand so and so, get round here now’ and she came and she said ‘What have you got?’ I said’ ‘Look at this.’ And she said, ‘Oh my God, fill a basket.’ I filled this basket. I must have bought sixty reels of thread – at a dollar a reel that’s nearly fifty pence. It was five pounds a reel at home, near enough. I’m not leaving it behind and I walked off with my purchase tight in my hand and then I came to the Robison Anton stand itself, with the man and I was looking at the boxed thread and he said, ‘Do you have a store?’ and I said, ‘Actually no,’ I said, ‘I’m just a visitor’. ‘You’re from England?’ And I said, ‘Yes’ and he said ‘What do you want?’ And I said, ‘Well, I like that and I like that and I like that and I like that. I said, ‘I just want it all’ and he said, ‘I can’t give it you all, ma’am’, he said, ‘But you choose three’ and I said ‘Ok, fine.’ So I chose three and he gave me two for free and I paid, I think I paid thirty dollars for… and there were twelve boxes, twelve reels in each box. I had gone to Heaven. I had absolutely… and then I found the cone threads on another stand and I thought ‘This is it. Thread Heaven here I am.’ I didn’t buy fabric because I knew when I got into Houston Show I would get fabric but here I was at trade prices and I still have some of those reels of thread upstairs. I haven’t used them all. I couldn’t use them all in a month of Sundays but I still buy thread, I still buy fabric but I’m very much more selective now. I always go with an idea. I don’t go and say, ‘Oh, I like that, I like that, I like that’, and just come away with yards. DB: Do you think we all go through that phase at the beginning, trying to generate a stash and then gradually become more discerning? JN: I don’t think we ever stop [laughter] I just think, I just think we get more money wise. We can go into a quilt shop, fabric shop, show whatever and we just want it all. And I know that there are people out there who go to these shows and just touch and smell. Some people just get a high from the smell of fabric, some people get a high from feeling, stroking… Everybody adores the feel of cotton fabric whether it’s got a shine on it or not. I know people who just love to pick it up and put it down and there are those that you see staggering round with bags and bags of fabric. And I look upstairs and I think… I have a storage system up there that used to consist of five sets of baskets with six trays apiece and every tray was full of fabric. Over the years I have whittled that down now to two sets of six but that doesn’t mean I’ve used all that fabric. I’ve just got stuff in other drawers because I needed additional space. I have two sewing machines. I needed a desk to put another one on and that was another mad buy at a show. Where do you stop? DB: Is there anybody or are there any individuals or techniques that have influenced you in the way your quilting patchwork skills have developed? DB: And do you do it? DB: How did you get into contemporary …because you said earlier ‘contemporary quilting’? JN: It was a total fluke, it was a complete and utter fluke. A few years ago they used to do a coffee morning at the Festival of Quilts, it seems to have disappeared now, and I was meeting some friends as I do, because I have friends that I meet up with, they come from Scotland, they come from Wales, they come from the west country, they come from the east of England. ‘Let’s meet at coffee morning, let’s all get a ticket and we’ll meet at the coffee morning’ so there we there and it was done that year by contemporary quilters and the first thing in we went we were given a raffle ticket and we were sitting having our cup of coffee and our Danish or whatever before things got started and my number was called out and I was given a book on laminating and fabric and I took this book and I looked at it and I thought, ‘Ooh I’ve never done this before. Oh how does this work?’ And then we started going round. When the bell rings you get up and you move onto another table. OK, fine. And I sat in front of Millie Thomas. Millie Thomas was painting Bondaweb. She’d ironed Bondaweb onto fabric and I was looking at this and I was thinking, ‘I love this.’ There was a lady sitting next to me with long ginger hair and I mean carrot-coloured ginger and I have no idea who she is to this day and I said, ‘I’ve got to have that piece.’ And she said, ‘I want that piece.’ And I said, ’No, I’m going to have that piece.’ ‘Two pounds’ and she, Millie, said, ‘Sold’. And she said ‘How do you…’ and I said, ‘I want it.’ I got it and she said, ‘So you’re now a…’ and I said, ‘I’m now doing, I love this, I’m into this, this is me, this is what I want’. And as we left that morning, having watched other people do other amazing things with paint, stamps, you name it they were playing with it, I was talking to one of the girls who’d organised it and she said ’So what do you think about this?’ and I said, ‘I’m out of my box now and I ain’t going back’. She said ‘Oooh, a convert’ and I said’ I’m going downstairs to sign up’. And that was when I signed up to become a member of the Contemporary Quilt Group. And I still play with fabric. I still do traditional, I still do the bits but I’m not restricting myself to it because quite honestly I think sometimes it can be a bit boring, the same thing. You know, same old, same old…But some things never change and I’m looking now at doing a Judy Mathieson Mariner’s Compass but putting a twist on it so although I’ve got the idea, it’s taking that and making it contemporary instead of traditional Mariner’s Compass. But that’s how I got into contemporary quilting. DB: And where do you see yourself going with quilting now? Say in the next five, six years? JN: As I get older being more restrictive with myself is not an option. I want to do more. I want to put my quilts somewhere. I get the feeling that I ought to do things that can be seen by a wider audience. I’m working on a quilt at the moment because I’m planning on signing up for this year’s Contemporary Quilters show at the Festival of Quilts. The title is ‘Dislocation’ and I’m trying to put my head together with this idea that I’ve got of a dislocation. What is dislocation? You go to the doctor with a dislocated shoulder or a finger or a knee but what else is ‘dislocation’? So if I can get that together in fabric as it is in my head and get that in because it will have to be photographed and sent off and it will have to be decided as to whether or not it is good enough to go into that show because there’s only a limited number. And if I’m lucky enough and it goes in, then fine. If I’m not lucky enough and it doesn’t go in, I may well put it in next year at Festival itself as a contemporary quilt because that will be something different and the same with my Judy Mathieson. Both of the fabrics for those are sorted. I have spent weeks putting those fabrics together and they are now on my spare bed, ready to roll. But I’ve got guests coming this week so I’ll have to put them away. But, if I get that done with my mind set on how I want to put that twist on it, I want to put that into Festival of Quilts next year. I would like to help, I want to teach people what I know about sewing, not just patchwork and quilting. I’ve found people in this area, in this village and in the village next, up the road, that there are youngsters and I met a twenty-three year old at the Quilt Museum last week. She’s a volunteer, she lives in the next village, she wants to learn to do sewing but there’s nobody to learn from. 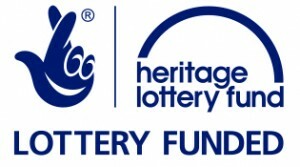 We’ve now got the possibility of a Heritage grant or some form of grant, I think it’s the Lottery Heritage, to start… I know it sounds a silly way of doing it… but they’re looking to start an old-fashioned dancing class that will also encompass crafts and part of the grant would cover buying sewing machines so that we could then have a village dance and craft club which will take it forward and the lady that’s doing all the background work on that, you know, putting the grant papers together, spoke to me yesterday and said, ‘You are on my list. We are going to meet you.’ ‘Ok, fine, let me know. 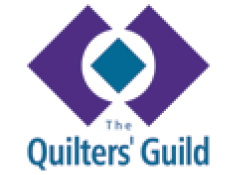 I’d be ha…’ I just want to know that what I’m doing is going to be picked up by others and the same with all quilters. We want it to carry on. We want the youngsters to get more involved. We want them to take it forward, to develop their skills. I’m still developing my skills. I’ve bought all the stuff to dye fabric with. I couldn’t get into it. My head wouldn’t work with dyeing so I gave all the dye pots to somebody else but I like stencils, I like screen-printing so it’s different and I like burning and I like fusing and I like cutting out and you know. I want to play and that’s what contemporary quilts means. But there’s a new group coming up called Modern Quilting and I’ve got some pieces upstairs that I think ‘I might just have a go at that’. I’m not sure that that’s the way I want to go, but I have got a block or two that might just go that way. But I want to give it a go. I don’t want to stagnate with contemporary and I certainly won’t stagnate with ordinary, everyday, standard, traditional quilting. I don’t do that. I won’t do that. But I don’t want to stop developing. I think if I stop developing my brain will stop, I know, probably. JN: If I’m not around, nine times out of ten, my family know I’m sewing somewhere [laughter] and if I’m not, because I also embroider, if I’m not sewing somewhere, at a show or working because I’m the Events Officer for the next three years of the Contemporary Quilt group, I have to be at places. I have to organise the annual meeting for the next three years in wherever it’s held. I have to be at certain shows to man the stand. I have to do my bit. I love doing my bit because again it meets my talents with others and I’m a great… One of my friends said to me ‘You are the most avid networker I have ever met.’ I can go to any show in any part of the UK and I will know at least one in ten persons that I see. In Scotland, at Loch Lomond, I walked into one church and instantly bumped into two people from Whitby that I knew. The next group, we were having lunch, sitting down at a table and a voice at the next table said to me, ‘Hi, Jackie, I’m Sheena’. She’s on the Contemporary Quilt committee. We’d never met before but she knew who I was and from that we met different people because she knows people that I don’t know. I know people in Scotland that she now knows and into another… you know, I was at Birmingham for Sewing for Pleasure on the Guild stand and there were so many people that came and said, ‘Hi, Jackie, how are you?’ and I was walking round and you get to know so many people. My circle of friends covers not just the UK but I can… I talk to people all over the world. I found out recently that one of my dear friends in Texas has done this quilt thing and it was because I was looking for her for the research on this, her name popped up as an interviewee and the next thing I knew I was reading her husband’s obit and that was very, very special to me because that made me sad because I had stayed with them in Texas and I knew her husband and I knew what a lovely man he was. So I’m a great networker and I look at people’s things and I think ‘I want to do that.’ Barbara Olson, she inspires me. I don’t love her stuff but she inspires me because she throws colours together. It could be a way I might take a Mariner’s Compass in throwing those fabrics together, instead of doing straight edges make them very, very wonky. I want to move on. DB: So there’s no end to it? JN: There’s no end to it. No, it’s like a reel of cotton. You might think you’re coming to the end of it but you need another one to finish what you’re doing so you have to get another one. It’s not going to last, you know. Quilting goes on and on. Yeah. So it’s a lifetime achievement for me I never thought when I was eleven years old and my aunt said to me ‘If you want to make this, this is where we start.’ And from that I have now got quilts on my walls, quilts on my beds, quilts in friends’ houses. Yeah. I don’t wear it. I’ve got patterns to make wearable quilts and patchwork stuff, but I’ve never done it yet and I just think ‘I haven’t got the time.’ I don’t sleep enough as it is. DB: Maybe, watch this space. JN: Yes, yes. I make bags for friends. I have a…. quilting bags, I send them. They go to Chester and Norfolk. People now walk around and everybody says, ‘Oh where did you get that bag? Oh unique, one-off’ Well, it is and they want one but I don’t have time to make them. I’m sorry. It’s a money-spinner, I could earn lots of money on it but I just don’t have the time to do it, to balance it. DB: I’d better let you get back to your sewing machine, I think. JN: I have deadlines. I have four journal quilts to do by the end of February, March, April, May, June, July, August. Oh I’ve got till August, but I must get them done before the Festival of Quilts and I’ve got four to do. Thank you. DB: Thank you, Jackie, that’s been just fascinating. Thank you very much indeed.